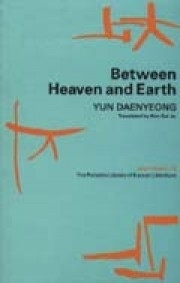 Between Heaven and Earth, the winner of the Yi Sang Literature Prize in 1996, is about a man, who, on his way to pay a visit of condolence, comes across a woman whose face is covered with the cold shadow of death. His memory of his own life having been saved by the sacrifice of his friend's precious life when he was nine, makes him suddenly change his destination and follow the woman to Wando on a snowy evening. He has a brief affair with the woman, who actually lured him to follow her in order to erase her previous life with a man who deserted her and left her pregnant. This moving story of a contingent relationship is permeated with the color of milky white, symbolizing life, and that color reigns over the black color of death. And the working of destiny in the human relationship unfolds against the backdrop of pansori, 'The Song of Simcheong' and the red camellias blooming in the white snow.